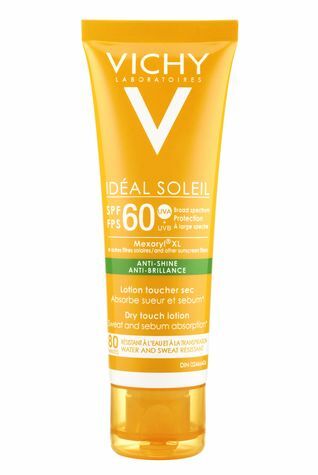 High protection sunscreen against UVA/UVB rays, for face, recognized by Canadian Dermatology Association. Long lasting anti-shine effect. 80 minutes water & sweat resistance. Dry touch lotion formulated for an active lifestyle and outdoor activities. Formulated with silica and volcanic perlite, Idéal Soleil Anti-Shine Dry Touch Lotion has lightweight, creamy feel that dries instantly to ensure long-lasting sweat, oil, & sebum absorption. It’s the perfect choice for those with combination skin or oily, sensitive skin types. This lotion contains patented broad-spectrum UV filters, including Mexoryl, for high UVA/UVB protection, and is water & sweat resistant for up to 80 minutes. It will help prevent sunburn and maintain your sun protection daily but also during high levels of activity such as swimming, surfing, cycling, running.